A wholesome gluten-free meatloaf, accompanied by a warming paprika sauce and served with crisp wedges. One of my favourites for when I am in need of a bit of comfort in my life. This is a perfect winter meal for a chilly day and can be prepared ahead of time and just popped into the oven for the final cook when needed, so great for when you have people over. The flavours in this dish never fail to impress. When you look down it may seem like an intimidating list of ingredients but I can assure you, this dish is simple to make and well worth the effort. It is a firm favourite I am asked to make again and again for friends. 6 large white or sweet potatoes, dependant on size. Chop one onion and finely chop 2 garlic cloves. Place the onion, garlic, cumin and coriander into a pan, season and add a little olive oil and cook on a low/medium heat for 10-12 minutes until soft. Whilst cooking the onions, cut the potatoes into wedges, place in a pan and boil for 8-10 minutes until just cooked on the outside. Make the wedge seasoning by mixing 2 parts salt, 1 part pepper and 1/2 part cayenne pepper. I tend to make up a batch and store in an old herb jar, so it is ready whenever I want to make yummy wedges. Once the potatoes are just cooked, strain and leave for 3 minutes for steam to evaporate. Then place onto a baking tray, sprinkle 2 to 4 pinches of the wedge seasoning and drizzle over a little olive oil, rub through and put to one side. Place the cooked onion, breadcrumbs, mixed herbs, eggs and mince into a bowl and mix together, then shape into a ball. Cover the bottom of a casserole dish with a little olive oil and place the meatloaf mixture onto bottom and shape. Place the meatloaf and wedges into the oven for 30 minutes. Whilst the meatloaf and wedges are cooking, prepare the sauce. Chop 1 onion and finely chop the chilli and 2 cloves of garlic. Place the onion, garlic, chilli and paprika into a pan, season and add a little olive oil and cook until golden. Add the peppers and cook for a further 2 minutes, then add the chickpeas, tinned tomatoes, balsamic vinegar and Worcestershire sauce and simmer for 15 minutes. Place the rosemary leaves into a bowl, drizzle with olive oil and a little salt and mix. Once the meatloaf is cooked, remove from the oven and add the sauce around the meatloaf, place the bacon around and sprinkle with the rosemary. 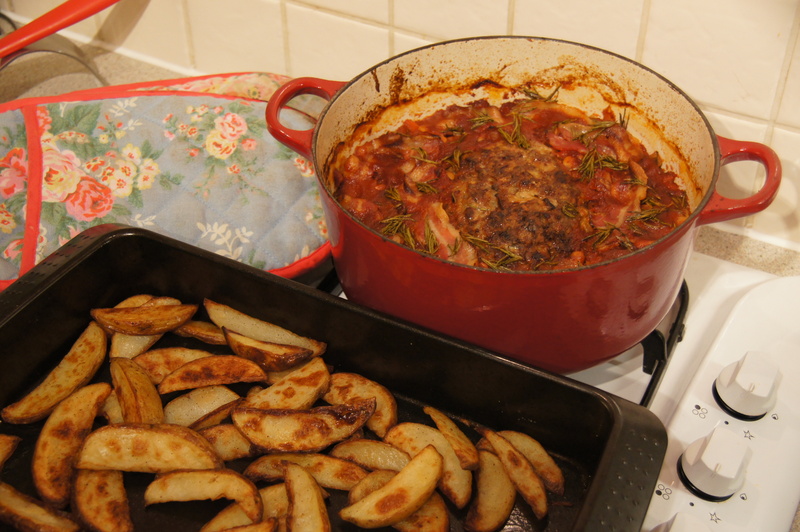 Place the meatloaf back in the oven for 30 minutes and in 10 minutes place the wedges back into oven as well. After the time remove and serve. This entry was posted in Dinner and tagged bacon, balsamic vinegar, beef, cayenne, chickpea, chilli, coriander, cumin, garlic, gluten-free, glutenfree, hot paprika, meatloaf, red pepper, shedding the wheat, smoked paprika, tomato, wedges, worchestershire sauce. Bookmark the permalink. I can vouch for this it is absolutely yummy and just perfect for a cold day or comfort food indulgence.